ORATORIO (AUS) (Bay 2001-Stud 2005). 4 wins-3 at 2, MVRC CS Hayes S., Gr.3. 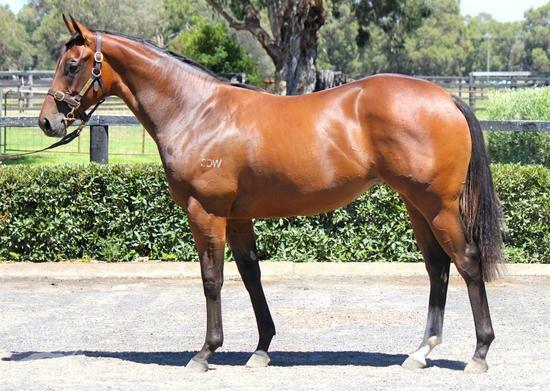 Sire of 407 rnrs, 248 wnrs, 16 SW, inc. Lucky Street (WATC Karrakatta P., Gr.2), Motion Pictures, Clueless Angel, Gold Rocks, Waratah's Secret, Misty Metal, Mr Motown, Private Dancer, Gold Busker, Rafaello, Cadenza, Palace Intruder, Belora, Like an Eagle, Latoria, Trustee Brown, SP Dancing Express, Outlaw Pete, Moet Me, Shades of Rio, Passion Cantata, Zetorio, etc. Leonorasensation (g. by Choisir). 3 wins at 1200m, 1300m, A$143,650, WATC Westspeed 3YO H., Westspeed H., 2d WATC Westspeed H.-twice, Kent Street Deli H., 3d WATC Westspeed 3YO H.
Happy Tops (g. by Strada). Winner at 1500m in Macau. Overnightsensation. 2 wins. See above. Final Arbiter. 4 wins at 1000m, 1100m in Aust. RAHEEB (Royal Academy). 4 wins at 1100m, 1400m, A$350,350, Newcastle JC Cameron H., Gr.3, VRC Paris Lane S., L, 2d STC Phar Lap S., Gr.2, BTC Doomben Classic, Gr.3, STC Concorde S., Gr.3, QTC Queensland Day P., L, 3d AJC Carbine Club S., L, 4th MRC Toorak H., Gr.1, STC Tulloch S., Gr.2. Sire. FASTNET ROCK (Danehill). Champion 3YO colt & sprinter in Australia in 2005. 6 wins to 1200m, A$1,724,100, VRC Lightning S., Gr.1, MRC Oakleigh P., Gr.1, VRC Lexus Classic S., Gr.2, AJC Up & Coming S., Gr.2, VRC Rory's Jester P., Gr.3, NSW Tatt's RC Roman Consul S., Gr.3, 2d AJC TJ Smith S., Gr.1, VRC Newmarket H., Gr.1, AJC San Domenico S., Gr.2, STC Pago Pago S., Gr.2, MRC Guineas Prelude, Gr.3, STC Skyline S., Gr.3, 3d AJC Sires' Produce S., Gr.1, VRC Poseidon S., L, 4th STC Golden Slipper S., Gr.1. Champion sire. Emotional Circus (Elusive Quality). 4 wins at 1100m, 1200m, A$281,550, Scone RC HTBA Protect Our Industry H., ATC Camden Hire H., 3d ATC Premiere S., Gr.2. Twirl (Lonhro). Placed at 2 & 3, A$85,695, 2d ATC Sweet Embrace S., Gr.2, TAB Iphone App 2YO P., 3d ATC Widden S., Gr.3. Han Xin - Sun Marshal (Sing.) (Sepoy). 2 wins at 1600m, 2000m, A$131,725, S$14,875, in 2017-18, MRC Jack Elliott H., 2d BRC Grand Prix S., Gr.3, 3d MRC Galilee Series Final H., L.
Distant Rock (Medaglia d'Oro). 4 wins from 1400m to 1600m, A$182,080, SAJC IGA H., MRC Hilton Manufacturing H., 2d SAJC Adelaide Guineas, L.
Juggling Act. Champion Imported Horse in Philippines in 2011. 28 wins from 1100m to 2000m in Philippines, Philippine RC Diamond I S., Ambassador Eduardo M Conjuangco Jr Cup. Sire. Heart Strings (Danehill). 2 wins at 1200m, 1250m, STC AAMI Golden Slipper Day H., Wyndham Estate P., 2d AJC Arbogast H., 3d AJC Keith Mackay H., L. Producer. So You Too (So You Think). 6 wins to 1300m, A$292,290, to 2017-18, SAJC Seppeltsfield H., 3d SAJC Euclase S., Gr.2, MRC Italktravel S., L.
Winning Focus. Winner at 1200m, HKJC To Kwa Wan H., 3d HKJC Sky is the Limit H., Los Angeles H.